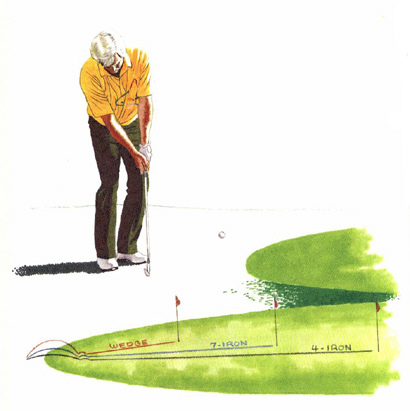 Jack Nicklaus likes to hit about 90 percent of his shots around the green with one club, his sand wedge. He plays it back or forward in his stance and varies his wrist action and swing speed to create several different sorts of chips and pitches. As much as I admire Jack and agree with his approach to the game, I part company with him on this point. Why work hard at adapting one club to a dozen different situations, when you have at least a half dozen other clubs in your bag to do the work for you, especially if you don't have the talent of Nicklaus? In most greenside situations, my goal is to get the ball rolling like a putt as soon as possible. I figure I have a better chance of judging and ultimately holing this type of shot than I would if I were to try to loft and spin the ball. Thus, I usually select the club with the least loft possible, given the situation at hand. If I have a chip of less than 7 metres to the flag, I'll usually take a wedge or 9-iron. As the shot gets longer, I'll use the middle irons. On the longest of chips, I'll go down as far as a 5- or 4-iron. In each case, I'll use the same, simple back-and-through chipping motion. By keeping your technique consistent, you reduce the variables and doubts, and encourage a firm, confident swing.